It has been observed so many times that when programmer creates table or stored procedure in SQL Server and when tries to run it with its name, they face an error that object doesn’t exists. If you are sure that you have created object even though it is not available even after you are having full permission in database than there is a case that, object owns by particular schema and you are not referring it while calling. There are few schema in Adventureworks database and each owns few tables. If you try to use table name only in SELECT statement, you will face an error given below. –so if you try like below, you are done. 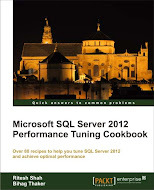 –use below give T-SQL statement.